When you are looking for the perfect single cup coffee maker to use at home there are several factors that you will take into account. Some will be personal to you, but many are universal. The style of the coffee maker is important. If it’s going to sit on your kitchen countertop and be there when your friends and family visit then it’s got to look good, right? The quality of coffee that it produces is a vital component of the buying decision. The functions that it offers make the difference to your day. Read my full Cuisinart SS-700 Single Serve Brewing System Review now and find out if it hits all of these spots. The Cuisinart SS-700 has some great features and functions which means it will be a great addition to your daily life. The housing is made of plastic, even when it looks like stainless steel. But that's ok, it still gives the brewer a stylish look. The stainless steel drip tray where the mug sits and the handle to open the K-Cup holder are the only real stainless steel parts. There is a large 80 oz water tank so you won’t have to constantly refill the coffee maker. Having a large tank of water is a great feature for the regular coffee drinker as you will have access to it all day long. This can sometimes mean that you forget to refill the reservoir. But fortunately, the tank of the Cuisinart SS-700 is illuminated light blue and will flash blue when water needs to be refilled. There's also “add water” being displayed, ensuring that you don’t run out of water ever. This is a handy feature that means you will be able to keep up your caffeine fix without major delays. 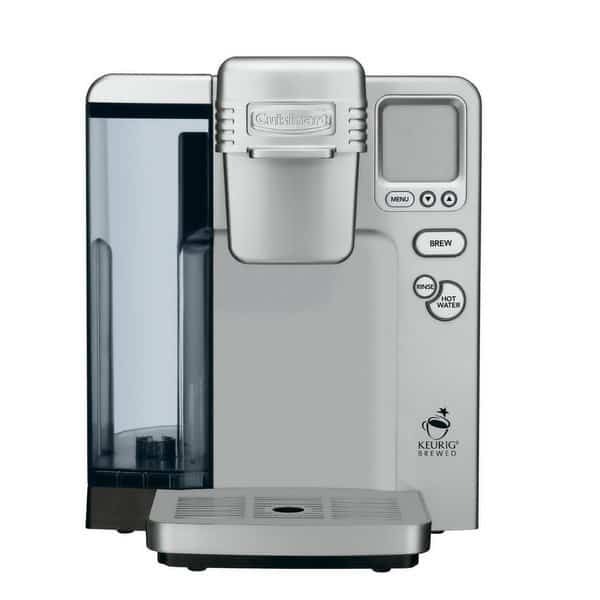 Easy maintenance is a key factor when making the choice of your next Single Serve Coffee Maker. The Cuisinart cleans just under running water with the use of a mild soap so is really easy to maintain. Please remember not to put the water reservoir or the lid in the dishwasher as they are not safe for dishwasher use. You can not only brew coffee but also a cup of tea with the Cuisinart SS-700 Single-Cup Coffee Maker. To make sure the taste of your tea is not affected by the last brewed coffee, the Cuisinart Single-Brewer has a convenient rinse button. This enables you to make tea and coffee in the machine in short succession without having an impact on the flavor. It's also great to just give the Cuisinart SS-700 Single Serve Brewing System a quick clean. If you like to make your coffee to go in a larger travel mug, the shiny metal drip tray is completely removable. This lets you use large travel mugs up to about 7 inches in size. With approximately 12” in height, the Cuisinart SS-700 single-cup coffee brewer fits nicely under most kitchen cabinets with standard 18 inches clearance. Even with the K-Cup holder open, it only increases the height to about 16 inches. As it needs to be pulled forward to remove the water tank, this can make it a tiring task, especially when you consider the weight at almost 16 pounds. 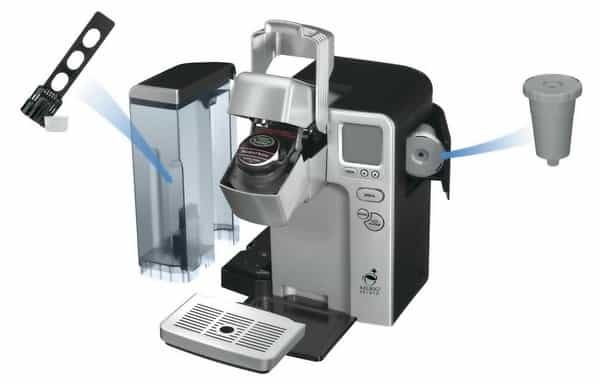 The weight is not just a disadvantage, as opening and closing the K-Cup holder or removing the water tank does not make the machine move easily. All in all, this is a sturdy machine that looks as though it will stand the test of time. The manufacturer includes a limited 3-year warranty so they obviously have faith in their single-serve brewer. You want your K-Cup Coffee Brewer to have a clear, logical display and intuitive settings to make sure that you can use it easily. The number of settings can make the difference for the regular user, especially in a family where people like different drinks of different sizes. Shall we see how the Cuisinart measures up? There are 5 different cup sizes selectable from 4oz to 12oz (in 2oz steps) while 8 oz is the default. 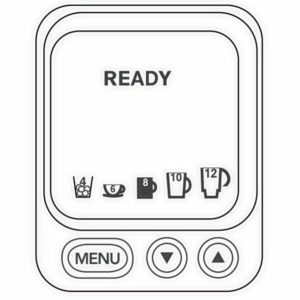 This all means that you can control the size of your coffee for whatever occasion you are making it for. It includes a setting for iced beverages, which does the smallest 4oz settings so you have the strongest possible coffee which is later diluted with ice. The blue backlit LCD display on this K-Cup Brewer includes the standard clock. There is no backup battery, meaning the clock needs to be reset after any power outage. Another great feature is, that you can decide whether the Cuisinart Single-Serve Coffee Maker should constantly stay on or turn off after a set time. The Single-Brewer stays on all time and is ready for a new cup of coffee within a second. You can still turn it off by hand. The Brewer shuts off after a set time, for example 2 hours. Probably the best setting for the night! You can set a timer to turn off the brewer, for example, at 8pm, and have it turn on again at 8am. Then it's ready for you to brew a cup of coffee without waiting more than a second. If you are often in a hurry and need your coffee immediately, make sure to keep the Cuisinart SS-700 on during this rush time! Otherwise, you have to wait for about 2-3 minutes until the water is heated. The Cuisinart Single Serve Coffee Maker has an adjustable temperature setting between 187°F and 192°F. This is essential to allow a change in the temperature setting if you live at a higher altitude. The brewing temperature is within the recommended range from the SCAA (Specialty Coffee Associaton Of America), which is a good thing! The hot water button will give you a supply of hot water for cereals, oatmeal, tea or even ramen noodles. Make sure that you don’t have a K-Cup in the loader, though! 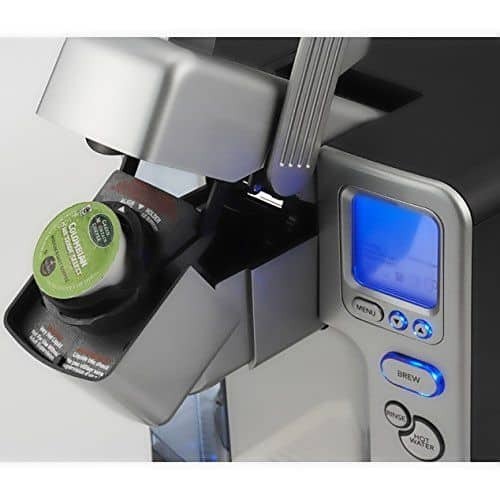 K-cups have become more popular recently, as they make the process easier and cleaner. The Cuisinart SS-700 K-Cup Coffee Maker can be used with all K-Cup brands and the reusable K-Cups. So you don't have to worry about being forced into Green Mountain Coffee, Keurig's own brand. In other words, this is not a Keurig 2.0 machine! And there is no DMR Restriction! You don’t need to have the original K-Cups. And you can use any reusable K-Cup filter. No K-Cup 2.0 DMR restrictions! If it fits, it brews! Simply said: if it fits in a Keurig it will work in this single serve brewer as well! You may wonder how to make a strong coffee with a larger cup selection when you always use just one K-Cup. Well, if you use original K-Cups (not the one that you fill yourself), there's not really anything you can do. Except, you can look out for K-Cups which are advertised as being "extra strong" or "extra bold". With the refillable K-Cup, you can try to use a finer ground and a lighter roast which has more caffeine. Of course the strength of your coffee is a matter of personal taste and you will find a brew to your own liking as you use this Single Serve Coffee Maker. Please note that I personally do not like K-Cups, as I feel they are not an environmentally friendly option. If you want to use a K-Cup Coffee Maker then I urge you to use biodegradable K-Cups or a refillable K-Cup. The refillable K-Cups with your own coffee can be also a real money saver as well. This is a well-appointed machine, so when you open the box you will find several items to go with the Cuisinart SS-700 K-Cup Coffee Brewer. Firstly it contains a K-Cup reusable filter which holds about 2 scoops of coffee of the included coffee scoop. This means that you can start down the road of reusing or refilling your k-cups. It also includes a charcoal water filter. This is included in case there’s chlorine taste in your water that comes through into your coffee. Another way to get around this taste is to use bottled or RO-water instead of tap water. There are also 12 K-Cup samples included in the package. This will help you as a new K-Cup user to determine your preferred blend. Of course there is an instruction booklet which explains how to use the machine, all the features and settings plus a useful troubleshooting guide. The Cuisinart SS-700 K-Cup Coffee Maker seems to be a great coffee machine. If you are looking for a fast coffee brewer that goes to work immediately then the Cuisinart SS-700 will probably do the job for you. It has great features to fine-tune your preferred brew and provides a decent cup of coffee for every occasion. The Cuisinart SS-700 offers a 3-year limited warranty. Many of the competitors on the market offer only a 1-year warranty. Why wait another day? Get your Cuisinart single-serve brewer now!